I have always struggled with planners. Even though I keep organized with Google Calendar and Wunderlist, something about actually writing down my plans has always appealed to me. 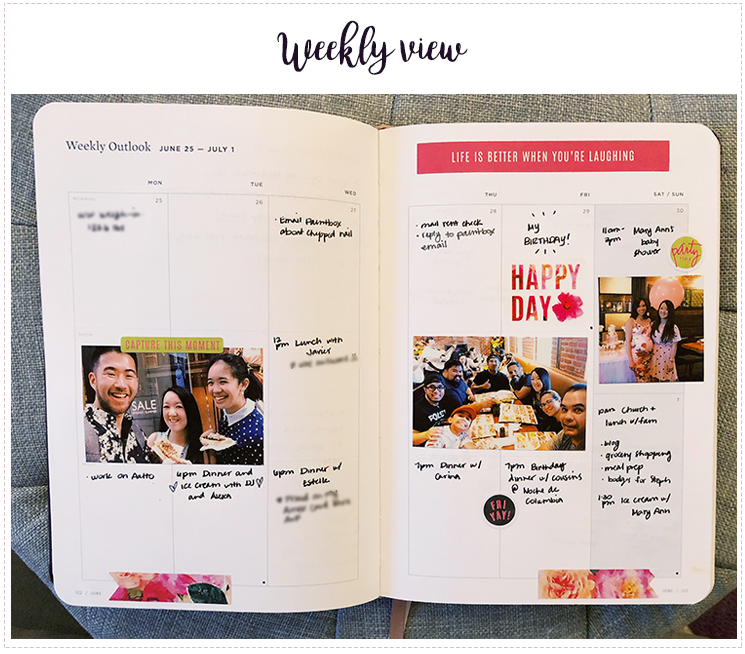 I love the idea of planners and I absolutely love to-do lists (I start nearly all my mornings at work with one) so I wanted to make a physical planner work in my every day life. Unfortunately, none of them seemed to stick. I was convinced that undated ones were best for me so I tried May Designs a few times, other random planners I found and even bullet journaling. None were exactly what I needed or they ended up being too much work. Then I found Ink + Volt. 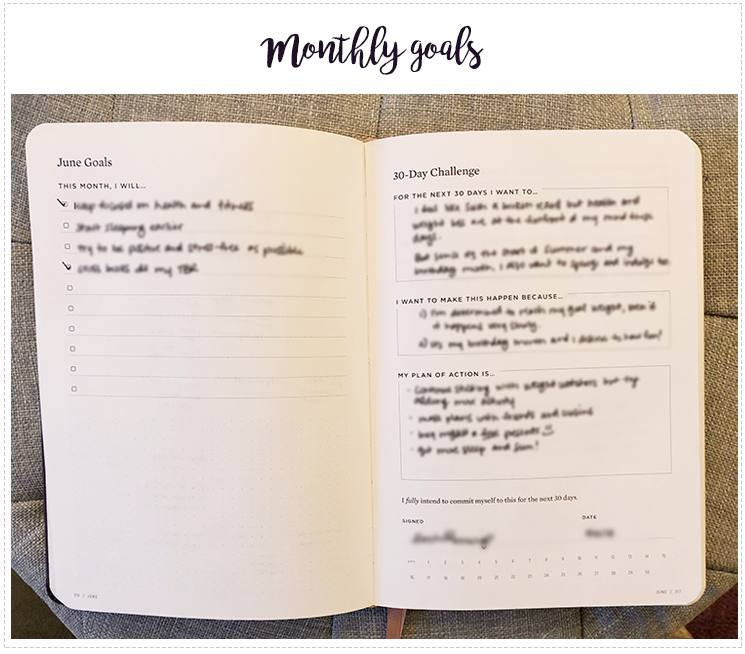 It was completely different from anything else I had tried because it was dated but there was also an emphasis on goals from a yearly, monthly and even a weekly perspective. 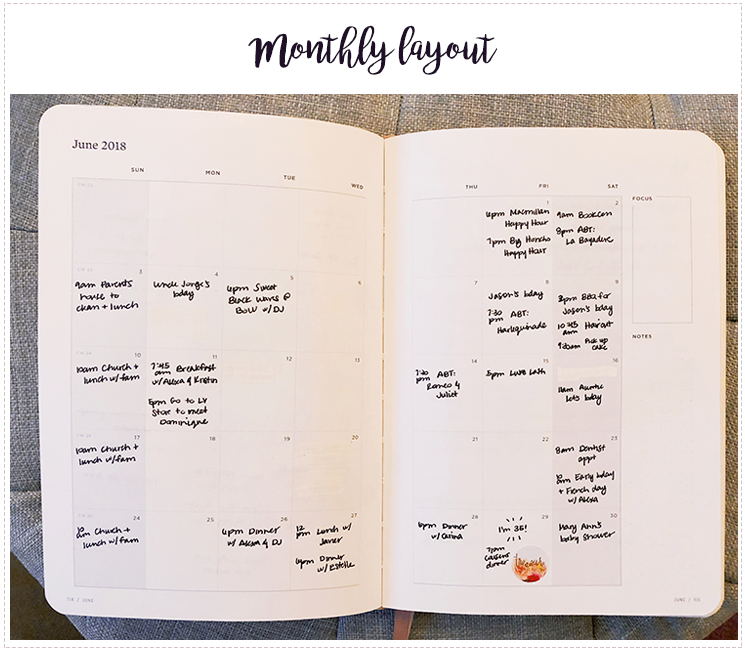 I was little skeptical about the latter but layout-wise it had exactly what I wanted – a monthly calendar view, a simple weekly view and a place to write lists. And guess what? 11 months later I'm still using it! 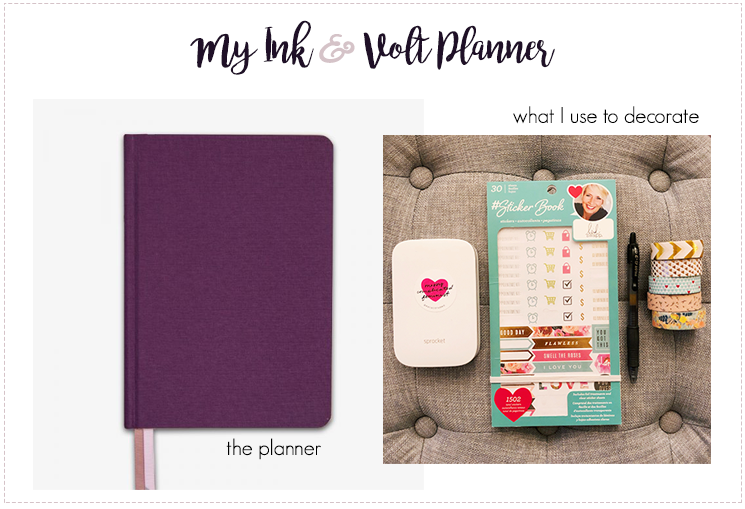 I thought I would share with you how I'm personally using this lovely planner and how I've made it work for me. 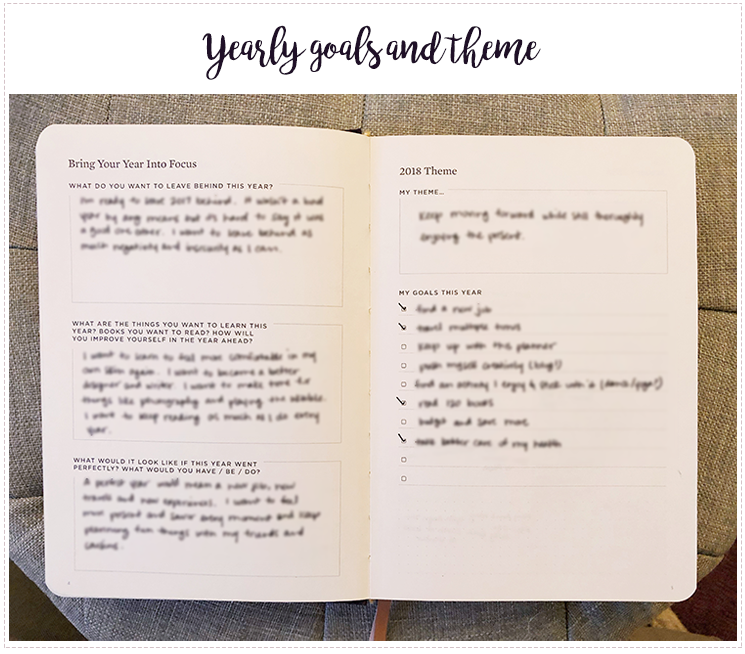 The planner starts off in a really thoughtful way that makes you think about the previous year and what you want the year ahead to be like. When I got the journal, I didn't know about these pages but they were perfect way to reflect as I filled them out on January 1st. Every month I look at this list and it reminds me of all that I want to do. I love monthly views! Don't ask me why but I just like seeing what my month is like. There's also space on the right to mention what you're focusing on or to add notes. I usually don't fill that out but as you can see, I keep my calendar up to date. Every month begins with your goals and what you're challenging yourself to do. Mine often repeat but I think that's okay. It's just reaffirming to myself what I want to do. And my monthly goals can range from serious (budget finances more strictly) to low-key like read more books off my TBR. When I first got the journal, I remember being surprised by the writing prompts at the beginning of each week. I wasn't sure if I'd fill them out but I actually do! Every Sunday night I take the time to write something down. 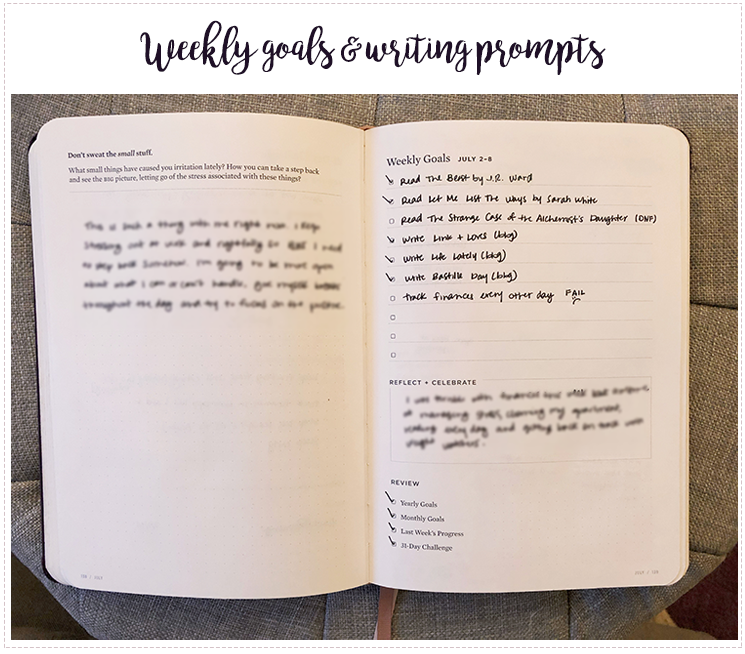 Then for weekly goals, mine just tend to be the books I'm planning to read, blog posts I need to do and then 1-2 "serious" goals if I'm feeling up for it. The "reflect and celebrate part" is what you fill out at the end of the week to talk about how your week went. I also like the reminders to review your progress and goals on all fronts. I love, love, love how simple the weekly outlook is. You can see the entire week and it's just three boxes per day divided up by morning, noon and evening. I write down plans and things I need to do. At the beginning of the week I'll decorate with washi tape and stickers but then at the end of it, I'll print out 1-3 of my favorite pictures to stick in (using my trusty Sprocket). It's a great way to reflect and feel thankful for the happy moments. So that's my Ink + Volt journal! As you can see I'm super happy with it and I already know I'm going to buy another one for next year. I think it's ideal for anyone who likes a ready-made and simple layout that's still customizable, enjoys writing and reflecting and making lists. If that's you, I'd highly recommend checking this out. Do you use this journal? Or if not, what journal do you personally love? Thank you so much for this!!! I needed this so much. You just made my whole year. Lol. I was able to google where to purchase the planner. By the way it’s on sale!! But where did you purchase the sticker book?